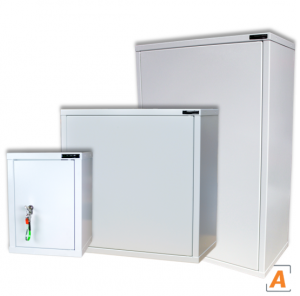 Here at SafeAway we supply a comprehensive range of medical storage cabinets. Our leading range f cabinets are favoured by NHS trusts, independent pharmacy and all in between. All our cabinets are manufactured in Great Britain to the highest standards. All our cabinets are manufactured to surpass the relevant storage requirements and legislation. Our controlled drugs cabinets are some of the best available on the market today. You can buy a CD cabinet from us in the safe knowledge that they meet all the relevant requirements for storing controlled drugs. Our medicine cabinets are some of the best available on the market today. You can buy a medicine cabinet from us in the safe knowledge that they meet all the relevant requirements for storing medicines in healthcare environments. 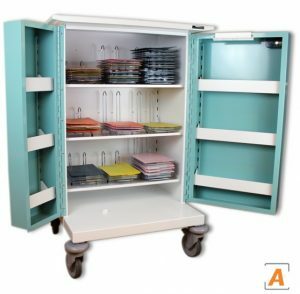 We stock a comprehensive range of MDS drugs trolleys for all applications. Our drugs trolleys are some of the best available on the market today. These trolleys have been designed carefully to survive the rigours of a care home round. When looking for medical storage cabinets, there are key features to note. Strength, security, durability and ease of use. Strength – All of our cabinets are manufactured from mild steel thicker than specified in the relevant requirements. For example a controlled drugs cabinet must be manufactured from steel thicker than 1.5mm. Ours use 2.0mm thick sheet steel. Our cabinets also feature intelligent design features increasing the strength of the joints and locking areas. 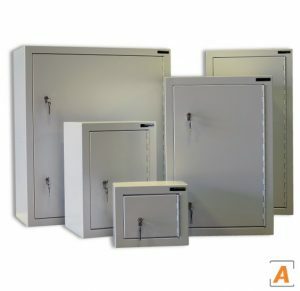 Security – As above, the thickness of our cabinets makes them more secure then the competition. Our design features also make them more resilient to attack. Furthermore the locks used have additional security features to prevent lock picking. Installed correctly, our cabinets are some of the most secure on the market today. Durability – The steel construction, and powder coated finish make our cabinets very durable indeed. The design and construction removes hard to access and covered areas making them easier to clean thoroughly. This makes them infection control friendly. The tough powder coated finish also makes them resilient to day to day use. The sheet steel construction removes areas for bacterial growth. Ease of use – The euro profile locks used on our cabinets are just like your front door key. Easy to use, and easy to replace if lost. The shelves in the cabinets are simple to adjust and our doors open fully, unlike some others, giving you clear access to the entire inside of the cabinet.